The statue was commissioned by the Pro Helsingfors foundation, which donated it to the City of Helsinki. Felix Nylund (1878-1940) entered a sculpture with a smith theme in 1913 in the competition for the J.W. Snellman memorial. In 1919, Nylund made a drawing where the three smiths are placed on top of a 10-metre column. Although these early plans were never realized, Nylund reapplied the theme in the `The Three Smiths' which was to be placed in front of the Old Student House. The `Three smiths' has been interpreted to symbolize, for instance, human labour and cooperation between people. The model for the master smith was Paavo Koskinen, a brick layer. The facial features are from the poet Arvid Mörne. 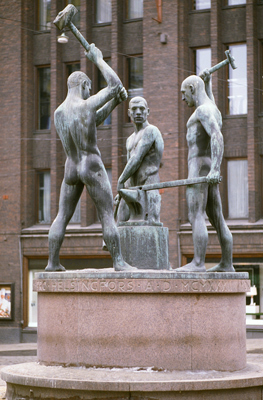 The smith raising the hammer is a self-portrait of the young Nylund, while the third smith was modelled on the stone cutter Aku Nuutinen, an important assistant of Felix Nylund's. The statue is realistic with tones of Classicism. The statue is cast in bronze and its pedestal is red granite. The Latin text "MONUMENTUM - PONENDUM - CURAVIT - LEGATUM - J. TALLBERGIANUM - PRO HELSINGFORS A.D. MCMXXXII" is inscribed on the pedestal. The work belongs to the collections of the Helsinki Art Museum.